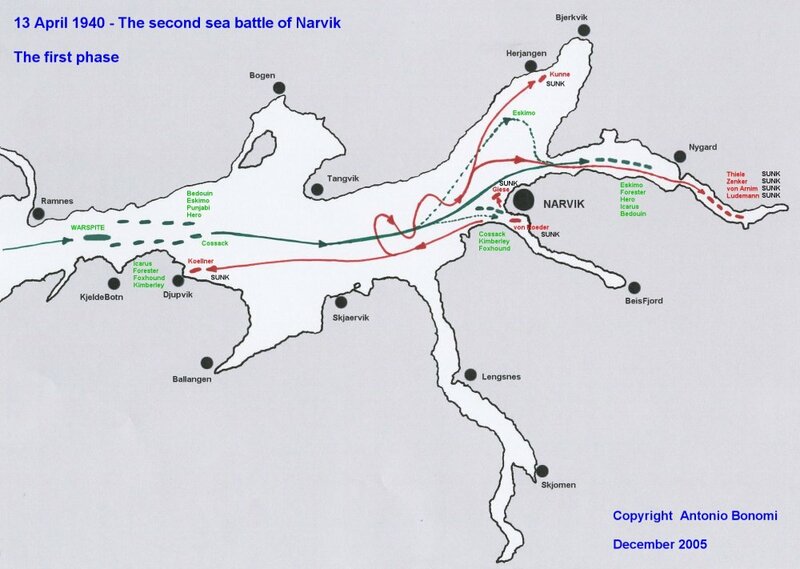 Here is the 2nd battle of Narvik, 3 days after the first one on 13 April 1940. The HMS Warspite enters the OfotFjord with 9 destroyers hunting the trapped German destroyers in the area. 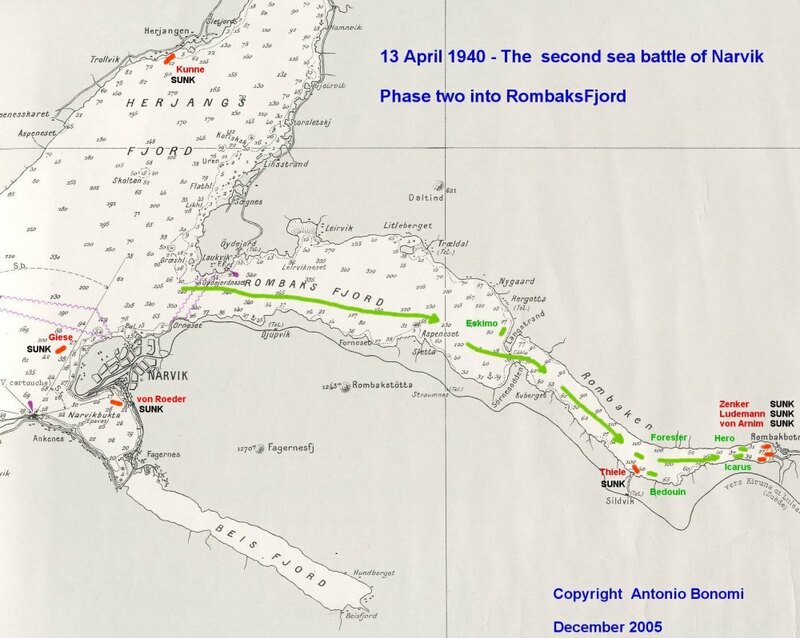 The remaining 4 destroyers are followed into the end of RombakFjord till they are forced to scuttle. Same as the previous topic.Great (and precious) work! Thanks, Antonio! Very nice work. I've always been fascinated by the events at Narvik in April, 1940. The loss of FdZ Bonte at Narvik was a huge loss to the KM Zerstorer forces. According to the admirals, he was a great loss to the entire Kriegsmarine. YES, the lost of Commodore Bonte was a huge price for Kriegsmarine destroyers. He was on board Z-21 Wilhelm Heidkamp mortally wounded by a torpedo fired by HMS Hardy on Narvik harbour during the first battle on April 10th, 1940. But Capt. Warburton-Lee was not going to have different destiny, as he was on board HMS Hardy and was sunk and died soon after too. Those guys put together a big fight, without big ships, but with lots of courage. on the morning of 13 April the Warspite’s spotting aircraft performed valuable services, attacking the submarine U.64, and spotting a German destroyer in an ideal position to launch a torpedo attack from one of the side fjords. Both vessels were sunk, the destroyer where it was found while U.64 was able to reach the far end of Harjangs Fjord, north east of Narvik before sinking. Most of her crew escaped.